Economic Modelling fills a major gap in the economics literature, providing a single source of both theoretical and applied papers on economic modelling. The journal's prime objective is to provide an international review of the state-of-the-art in economic modelling. 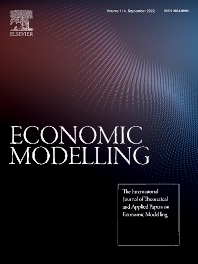 Economic Modelling publishes the complete versions of many large-scale models of industrially advanced economies which have been developed for policy analysis. Examples are the Bank of England Model and the US Federal Reserve Board Model which had hitherto been unpublished. As individual models are revised and updated, the journal publishes subsequent papers dealing with these revisions, so keeping its readers as up to date as possible. The main subject areas covered include: national macroeconomic models (for both advanced and less developed countries), growth models, optimization models, planning models, international trade models, interaction of national and regional economies, general equilibrium modelling of national economies, modelling structural adjustments, sensitivity of econometric models to alternative macroeconomics policies. Recent Special Issue: Financial liberalization and housing market dynamics.